In an earlier post I highlighted the importance of using Google Analytics to measure the activity on websites and blogs. Also, in another post, I discussed the importance of being able to pass the 8-second test. Today's post is looking at how the first, Google Analytics, helps to measure whether the second, the 8-second test, is being achieved. Plus it considers if performance is going in the right direction. In the diagram below is a trend analysis taken from my Google Analytics report. 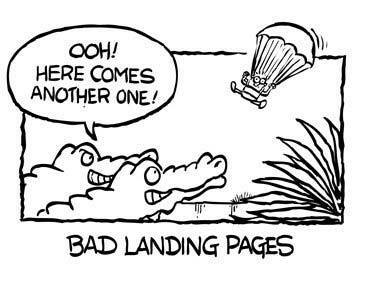 Depending on which research you read, the average bounce rate for a website is just over 40%. My current bounce rate, from my Google Analytics report is showing it to be under 16%, and the trend downwards, which is also very positive and encouraging. Let's say you have a website where the bounce rate is currently 30%. That's better than average, and you may be happy with that result. But what was it, say a month ago? If it was higher than 30% then the performance of the site is improving. If it was lower than 30%, the performance of the site is dropping off. Current performance is just an indicator of what is happening now. A trend indicator helps to identify if things are getting better, or worse. One key tip with lowering bounce rates is to ensure all links on your site, which go to another website, open the other site in a new window. If they don't, clicking the link takes your visitor away from your site, perhaps never to return. When you add an image into your blog posting within Blogger, the software has a built in default. If someone clicks on the image, it just opens up in a lightbox. Just click on the image below to see what I mean. But before you do, remember to click the cross in the top right hand corner of the lightbox to close the image. So as you saw, if you did click the image, it essentially opens in the same window, which in turn increases the chances of someone incorrectly closing the page. 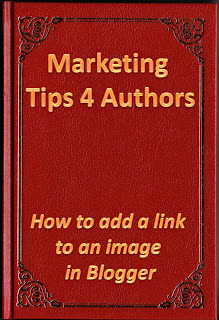 One thing you may want your reader to do is go to another location, using the image as a link. 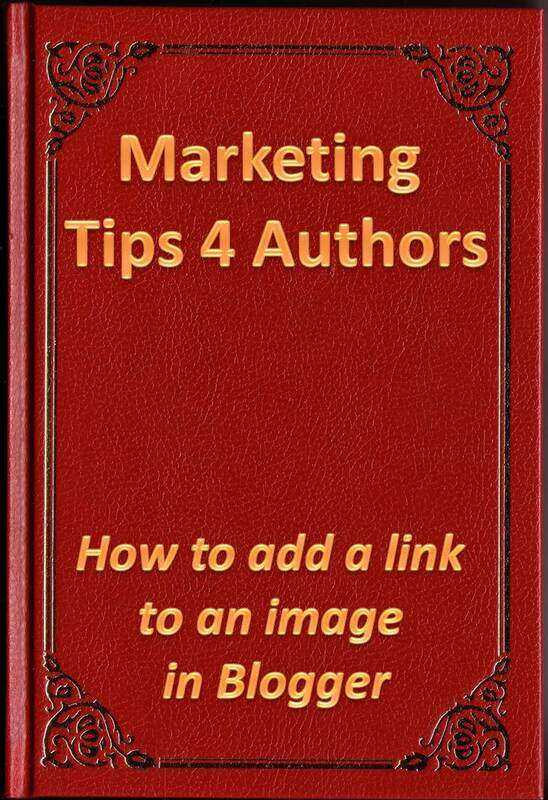 To help overcome this problem, I've written a tutorial on my author website explaining how to set up an image with a link when using Blogger. And to prove it works, and to read the tutorial, just click on the image below to be taken to it. You'll also note the link opens a new window. If you read the tutorial I hope you found it useful. 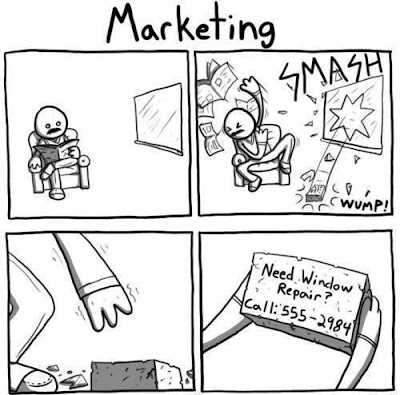 The best marketing campaign ever? Sometimes humour is a great way of getting a message across. As authors our first objective is to gain attention for our book(s). If we are using tools such as Twitter to grab that attention, then the message has to stand out from the crowd. That is a huge challenge with only 140 characters to play with, particularly if 20 of those characters are being used to create a link to your book. Location: Placing adverts or messages in very unexpected situations. I once ran a full-page newspaper advert upside down. It certainly created a spike in sales, but after requests from other advertisers, who wanted to do the same thing, the paper refused to run any more adverts upside down again. Coming up with an idea before your competitors is always an advantage, as ideas can quickly go stale. Shock factor: Grabbing people's attention can be done easily with a shock. The cartoon above being an example. Shock is a dangerous strategy if it goes wrong, but get the balance right, and it can have dramatic results on sales. Personalisation: It's hard to ignore something if it is aimed at you specifically. Many authors run blogs similar to daily newspapers, and their tweets state 'top stories today from ________' Imagine the blank space contains your Twitter handle. Will you click the link? You bet. I hope this post has inspired you to think of different ways to grab the attention of your target market. One of the drawbacks of seeking a good read from an indie author is sorting the wheat from the chaff. Even the main stream publishers don't always get that right, but as a reader you know the book has at least gone through a thorough review system. This of course isn't necessary the same with self-published books. Some do get professionally edited, and others don't. If you have one of the former, and want to give yourself an edge in the marketplace, then you should consider submitting it to Awesome Indies. Plot and Structure — the plot is well structured, well paced, conceptually sound and engaging. Characters — the characters are well developed and their dialogue and interactions with others are believable. Wordiness or overwriting — the book is not excessively wordy, particularly, no rambling descriptions, dumps of information, unnecessary repetition or irrelevant scenes. Point of view — changes in the point of view of the writing are clear, specifically no confusing quick jumps from the thoughts of one character to another and back again. (head-hopping). Engaging writing — the writing is immediate and engaging. This means that the story is generally shown rather than told, and the writing is active rather than passive, eg doesn’t overuse forms of the verb, ‘to be’. Grammar, spelling and punctuation — the grammar, spelling and punctuation are correct for the author’s country of origin. Give the Awesome Indies site a visit. It's a goldmine of interesting ideas and tips. Once your book is submitted, reviewed, accepted and gets featured on the site, you know you have a product which you can market with added confidence. 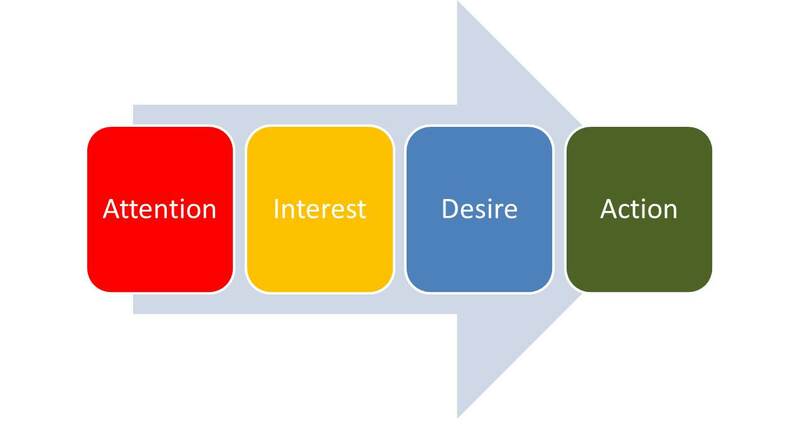 Does your website/blog tick all the 5Cs? 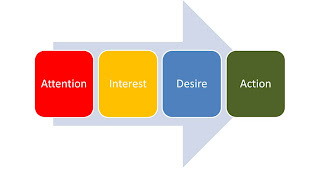 This neat little marketing model will help you to do a quick sanity check on certain aspects of your website/blog. Some may sound very obvious, but in our busy lives sometimes the obvious can get overlooked. Context : One thing I often see with many websites is lots of clutter which hide the key messages. It's almost as if some people want to put everything on one tiny page. Removing some of the clutter, particularly from 'above the fold', can help deliver the key messages with more force. (See more about 'above the fold' with my post about the 8 second test for websites.) So the sanity question here is - Is my site uncluttered, easy to navigate around, and does it have some white space (or at least one colour space) to aid readability? Commerce : If you are selling your books directly from your site is it fully secure, from the buyers perspective? Any pages which require customer details, which are sensitive, need to be fully encrypted. If the page doesn't start with https in the address bar, then it's not secure. Connection : If you have links to other sites, what happens when the visitor to your site clicks them? If they are taken directly to another site in the same window, and they find something more interesting, you've lost them. All your external links should be set to open in a new window, leaving your site still on view. 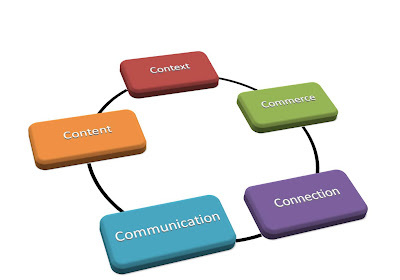 Communication : How does your site visitor communicate with you? If it is via a comments box be sure to place a disclaimer next to it. Many website owners harvest email addresses for financial gain, and therefore a disclaimer is important. I use "IMPORTANT - email addresses are ONLY used to respond to messages, and are NOT sold or used for any other purpose" on my site. Also, avoid putting your email address on your site, unless of course you enjoy your inbox being overloaded with junk emails. Unethical people harvest advertised email addresses, often via a bot, and sell them on in large numbers. Content : Is all the content relative to the information and/or message you are trying to deliver? Is the text easy to read (not too small, but equally not too big) and are there sufficient pictures/graphics to add interest to the site? Again, the post regarding the 8 second test may be of further help. Maintenance of a website is important, and should be viewed as an ongoing task. Think of it like an F1 racing car. The designers are constantly making adjustments to the cars to gain extra performance. The better a website performs, the better it does its job. All of your readers, and potential readers, will be somewhere on the ladder below. Sadly, most will be still on the ground, having not heard of you, or your book. But at one level, that's good news, as you haven't yet run out of readers. 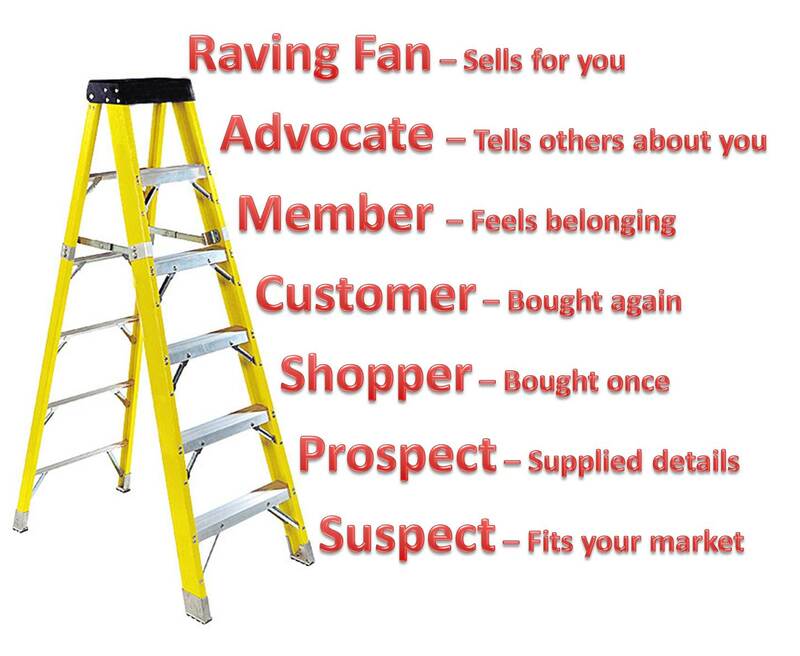 Many in the 'suspect' group, in time, could be 'customers' at the very least, if not 'raving fans'. Your job as an author is to guide people up each rung of the ladder. The more people you get nearer the top, the more success you will experience. Some people will move up the ladder quicker than others, often several rungs at a time. For a 'suspect' to become a 'prospect', you need to take every opportunity of getting your message across. This can be achieved via social media, websites, blogs, forums, online groups, the list is almost endless. Once the 'suspect' is aware of your presence then AIDA needs to come into play, to convert a 'suspect' into a 'shopper'. (Check out the previous posts on AIDA - Part One and Part Two.) 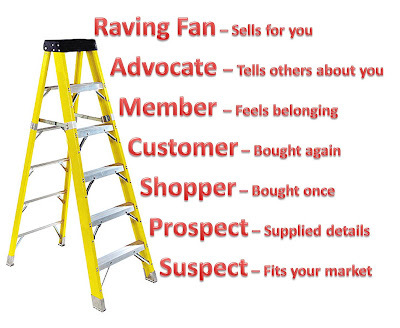 If you have published more than one book, the 'shoppers' need to be convinced to be 'customers', and even the 'customers' need to be encouraged to take further steps up the ladder. Your marketing machine must never be 'switched -off', and the more creative and innovative you are, the more likely success will follow. USP stands for Unique Selling Proposition (or Unique Selling Point). It is about differentiating your product (in this case a book) from the rest. Consider this question. Why should someone buy YOUR book? What makes it different from all the other books in your chosen genre? Sadly, if you don't know, then how is your potential reader? So far that's more questions than answers, but let's look at a few things we can consider. In an earlier post I discussed the importance of a book cover. The right cover does sell a book, or at least grabs the attention of a potential reader. So how can you differentiate between your book and others, if both have similarly attractive covers? Most book covers on the Internet are flat two-dimensional images. By producing a 3D cover, and perhaps adding a review, you can make the book stand out. 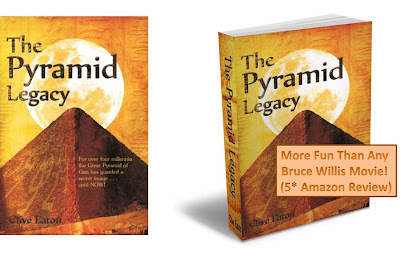 Below are two views of the cover of my book - The Pyramid Legacy. The one on the left is the standard flat two-dimensional image I have to use on Amazon, but the one on the right is a 3D version, complete with a book review, which I use on my website, and any other site which will accept 3D images. Sometimes the title of a book doesn't convey the full story, so one or two short sharp sentences are need as attention grabbing headlines. I use "A sci-fi plot twisting the fibres of history together with those of the future . . ." and "For over four millennia the Great Pyramid of Giza has guarded a secret image; until NOW!" on my website, as an introduction to The Pyramid Legacy. Now, I'm not saying for one minute they are perfect one liners, but I think they do convey the link between the past and the future, together with some level of mystery. By creating even the smallest USP you can help your book stand out from the crowd. This is just an image selected from my 'Contact' page within my author website. I used the Windows 'Snipping Tool' to capture this image, straight from the website. 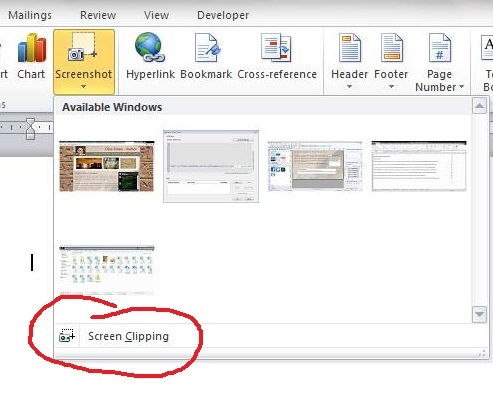 If you'd like a full tutorial on how Windows 'Snipping Tool' works, then just visit Bleeping Computer. They have produced an excellent step by step explanation. Another 'clipping' tool is available in Word. If you want to paste a selection of a picture directly into Word, then this can be done using 'Screenshot' within Word. It can be found under the 'Insert' tab of the main menu. If you click on the small arrow below the word 'Screenshot', an extra window will open, which shows all the main windows open on your computer at the time. You can then take a screen shot of any of the windows open, by clicking the specific window you want. If you want a small sample, this can be done by clicking 'Screen Clipping'. This will allow you to select part of the window which is currently open. You then simply hold down the mouse, and select the area you wish to copy. So that's a short overview of two very useful tools for quickly selecting images to copy and save. Sorry, only kidding. It is 1st April after all. However, there is a more serious side to this post, and if you arrived here via my Twitter message, then you will have realised the importance of creating an attention grabbing message when marketing your books. So therefore the real purpose of the above headline - 'Amazon to stop selling ebooks' - was to demonstrate how important AIDA is within your marketing activities. So as a brief reminder please visit my post AIDA Part One to fully understand the principle. In the meantime, enjoy Easter Monday wherever you are, and remember to use AIDA within your marketing strategies.